As I mentioned yesterday when I did my review for the Overtime Masque, my skin has been completely messed up since I started using Retin A from www.forhers.com. So much that it is constantly peeling and dry yet it is leaning toward finally stabilizing. 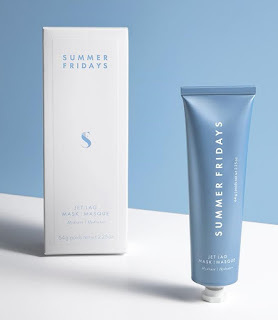 One thing that has been helping my skin is the Jet Lag Masque from Summer Fridays. Using Retin A is like attacking your skin. It will never know what hit it. There are a couple of ways to wear this mask. It can be slathered on as a regular mask, with a thin layer on cleansed, dry skin (including the under-eye area). Leave on for 10 minutes then wipe off excess with a warm cloth, no need to rinse. Or, use it as an overnight mask, apply to skin then leave on overnight. I personally use it this way. It can also be used as a primer under makeup too. Just apply a small amount onto skin under SPF. Makeup will go on like a dream and skin will look amazing all day. Jet Lag Masque leaves skin looking and feeling like it is dewy and so hydrated that it is not at all dry. This is one of the best hydrating masks I have ever used and I would highly recommend it for skin that is dehydrated, dry, irritated or in need of a quick pick-me-up. This mask does wonders for skin and I think it works best when used as an overnight mask, because it can really seep into skin and the ingredients can work their magic overnight that way. Summer Fridays Jet Lag Masque can be purchased online at www.summerfridays.com or www.sephora.com. Like Summer Fridays on Facebook: http://facebook.com/summerfridaysbeauty; Follow Summer Fridays on Twitter: @summer__fridays and Follow Summer Fridays on Instagram: https://www.instagram.com/summerfridays/.